Which software is the best free file transfer program ? Please try Folder Transfer, which is a PC to PC file transfer software that can transfer your files and folders over LAN (Local Area Network) or over Internet (remote network access). You can use this auto file transfer tool to send files to multiple destinataions at a time. Please download Folder Transfer for file transferring between computers. 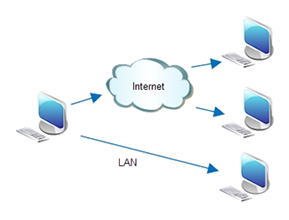 Transfer files to other computers over internet or local area network (LAN); Share files and folders to let other users to download over nework anytime. You can use this free file transfer software to transfer files from one computer to another, or send files to multiple computers no matter they are located in your office LAN , home network or even corporate remote networks. Case 1: When you buy a new laptop or new desktop computer, you want to transfer your files from the old pc to your new computer. You will think about: Which is the easiest way for transferring my files from the old computer to new laptop ? The answer is Folder Tranasfer. Free version is available to let you use all the features of the file transfer utility. Case 2: As a marketing manager or sales person, you may need often copy files and folders from company's server or your desktop in order to show some key information of your company's products and services. So you will have such questions at your company, how can I do a pc to pc file transfer? more exactly, how to transfer my files from desktop to laptop ? If you are out of office, how can I get files or data from my company's server remotely ? What is the best way to transfer my files and folders between computers, especially when there many files need to copy or move ? Definitely, Folder Transfer is the best pc to pc file transfer utitlity for you to transfer your files between two computers. In addition, it is an auto file transfer software program, you just need to drag the files and folders into the program window, then you can transfer all of the files to another computer. Yes! Try Folder Transfer, which is one of the best remote file transfer programs that can transfer files via Internet or other remote access like VPN, Intranet, WAN. If you need transfer a large file or a folder with a lot of files, it is not feasible to use e-mail attachment that is email service provider like gmail (it has some size limit for attachment, a big size file is not allow to be attached to an email.) If you use any other public cloud service solutions, all your files will be stored outside your organization, and there is also a storage limit for these kinds of services. You have to pay monthly for any extra file transfer size. And both email or cloud service provider doesn't allow you to send a folder, and you have to transfer hundred of files one by one. So, you will have such a question, what is the best way for large file transfer between two computers remotely ? Folder Transfer provides you with the best way to transfer large files and folders. What benefits will you get from theis filetransfer software ? No matter you wish to implement a file transfer from laptop to desktop, or transfer files from desktop to laptop, Folder Transfer is the best way to transfer files pc to pc. Especially, when some colleagues need transfer files between laptops because they are doing a same project, and these files and folders are 100 MB or less, and then you can use Folder Transfer, which is a file transfer freeware to help you transfer files from one laptop to another laptop. If you are a salesman in your firm and need get new product materials from your manager's desktop, all the files are in a same folder and are updated every month, what is the best way to transfer files from computer to laptop ? Try Folder Transfer ! You just need to drag and drop the folder into the software, and select the destination computer you wish to transfer, all files will be transferred automatically. Folder Transfer is the best free software for file transfer between two computers. When you buy a new computer or laptop, mostly you will want to transfer files from the old computer to the new computer. What is the easiest way to transfer lots of files and folders from the old pc to the new pc ? It is quite tedious to move thousands of files from the old laptop to the new laptop by using USB or an external hard drive or copying files to another network drive (it will occupy huge disk space on another computer's harddrive. Is there a very convenient method to transfer files from your old computer to your new computer ? Folder Transfer will be the best way to transfer files from a old pc to a new pc. You just need to select the files and folders you wish to move to the new pc, then select the new computer name in the software program window, all the files will be transfred fast. Transfering files to a remote computer via Internet usually brings you headache because you don't know the remote computer's IP address. Folder transfer provides you with the easist way to tranfer files betwenn computer over Internet, Intranet or WAN. With its flexible network connection methods, it is not required for you to know the remote computer's IP address or port number. 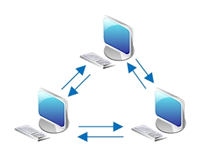 all the computers can connect together by joining a same network group, then they can transfer files between each other. Definitely, you can also input the remote computer is IP or port number to set up the network connection, then remotely transfer files between computers. You can share your files and folders over networks (office local network or Internet), and others can download the files from your computer anytime. So, Folder Transfer is also a file sharing software program. You don't need to transfer files to others' computers, just let them download or get the files they need. Folder Transfer is the best free software for transferring files from pc to pc and for remote file transfer between computers over Internet.